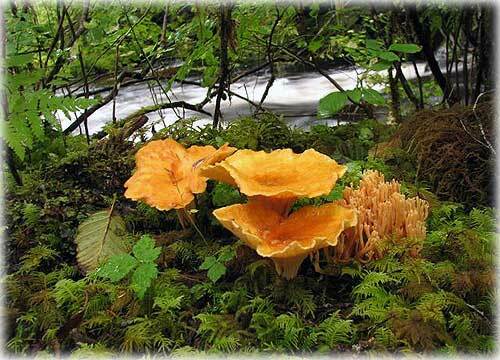 Ketchikan, Alaska - Rainwater sparkles in the vase-shaped cap of a woolly Yellow Foot Chantrelle. Growing on the right is an Orange Coral Mushroom. These colorful mushrooms were photographed along Lunch Creek Trail. The edibility of the woolly Yellow Foot Chantrelle is questionable since it reportedly has caused gastrointestinal upsets in some consumers. One should always be extremely careful when picking wild mushrooms - some species are poisonous. Watch for the launching of Lewis' new Alaska photos website.